Music in the early 21st century combines technology and media in unexpected ways with acoustic instruments and human voices. Sonic artist Jesse Allison’s work traverses from music to sound environments, laptop orchestra to audience mobile phones, interactive installations to loudspeaker orchestra. This performance in the Digital Media Center Theatre’s 92 speaker immersive sound environment will push one’s experience of sound and music to its limits. Jesse Allison is a leader in sonic art technology, thought, and practice. Dr. Allison holds the position of Assistant Professor of Experiment Music & Digital Media at Louisiana State University. As part of the Cultural Computing focus of the LSU Center for Computation & Technology, he performs research into ways that technology can expand what is possible in the sonic arts. Prior to coming to LSU, he helped to found the Institute for Digital Intermedia Art at Ball State University and Electrotap, an innovative media arts firm. Research and invention interests include computer interactivity in performance, distributed music systems, mobile music, interactive sonic art installations, hybrid worlds, and multi-modal artworks, those that can be experienced through a variety of means. As such, he manages the Media Interaction Laboratory and Library (MILL), co-directs the Laptop Orchestra of Louisiana (LOLs), and heads up the Mobile [ App | Art | Action ] Group (MAG) for the CCT. As an artist, Allison has disseminated his work around the globe through live performance art, interactive installations, virtual and hybrid worlds interventions, and presentations. Recent performances/exhibits include the Pixilerations Festival, New Instruments for Musical Expression (NIME), Siggraph, Techfest Bombay, International Computer Music Conference (ICMC), the IUPUI Intermedia Festival, Boston Cyberarts Festival, and the Society for Electro Acoustic Music in the United States. Allison received his doctor of musical arts in composition from the University of Missouri — Kansas City. 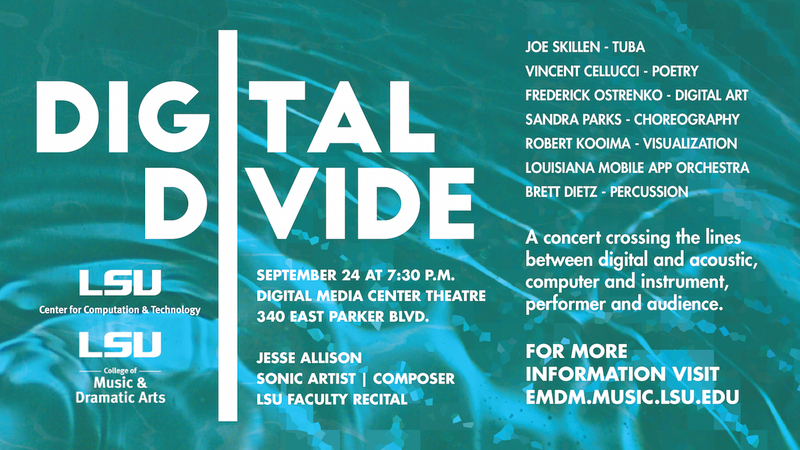 For more information on the Digital Divide performance, email: jtallison@lsu.edu .